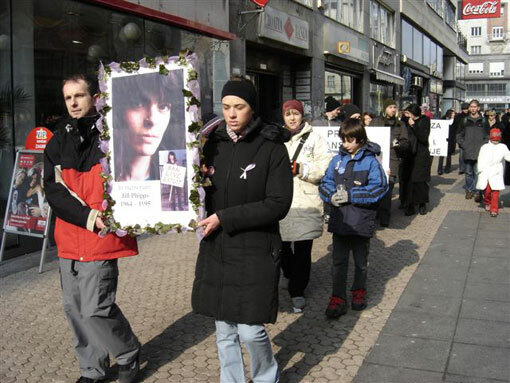 On Saturday, February 5, 2005, Animal Friends' activists will mark 10th anniversary Remembrance Day for British animal rights activist Jill Phipps. The march will set off from our info stand in Gajeva ulica in front of Dubrovnik Hotel where it will also end. Marchers will wear purple ribbons and a picture of Jill Phipps and will march down Gajeva ulica, Teslina, Praska, and across Ban Jelacic Square. Jill Phipps campaigned tirelessly for animals in her home town of Coventry and across the United Kingdom. On February 1, 1995, whilst protesting against the export of veal calves from Coventry (Baginton) Airport, she was tragically killed under the wheels of a livestock transporter. Animal Friends will hold a lecture about Jill Phipps in club Mama (Preradoviceva 18) on Tuesday, February 8, 2005, at 7 P.M. They will talk about her life and her fight against separation of young calves from their mothers so people could drink their milk and one against killing of calves for food, and will also remember other humane victims in animal right movement. What is the Price of Life?? Jill Phipps was just one of thousands of devoted activists from all over the world who try to end this unnecessary cruelty in the name of profit. Her dedication, love towards all living things and to all life she paid with her own. What was the price of her life? And what was the price of life of Mike Hill, hunt saboteur killed in 1991; or life of Tom Worby, a 15 year old who was crushed under the wheels of van during foxhunt protest; or life of Vicky Moore who was, during investigation of Spanish Blood Fiestas, near fatally gored by a bull named "Argentino" and after several surgeries and in constant pain died in 2000; or life of Barry Horne who died during his fourth hunger strike trying to pressurize the government to honor their pre-election promise to set up a Royal Commission into the fraudulent 'science' of vivisection. 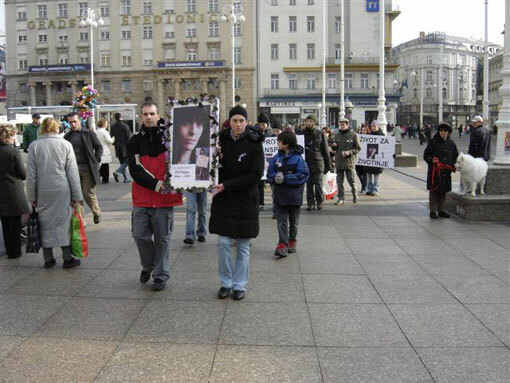 Animal Friends calls all Croatian media and people to mark February 5, 2005 and learn more about why so many people like Jill devote their lives to fighting for animal rights.